I’ve had the privilege of handling many rare timepieces in the past; some of them make more of an impression than others, for various reasons. 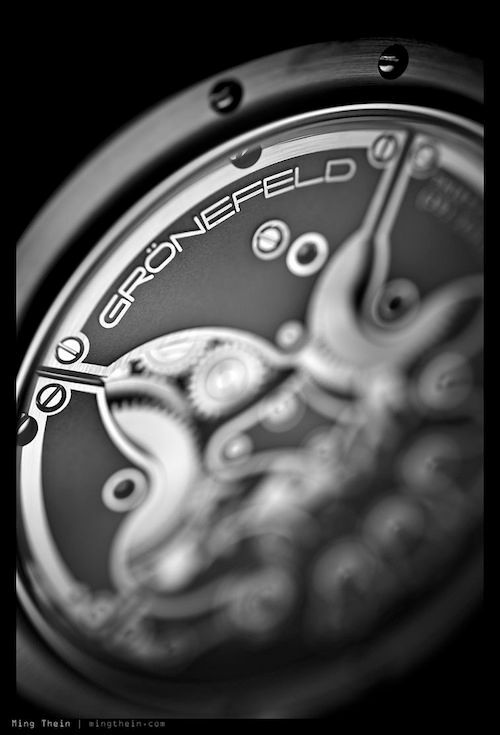 The Gronefeld One Hertz is one of these – but for a very different reason. 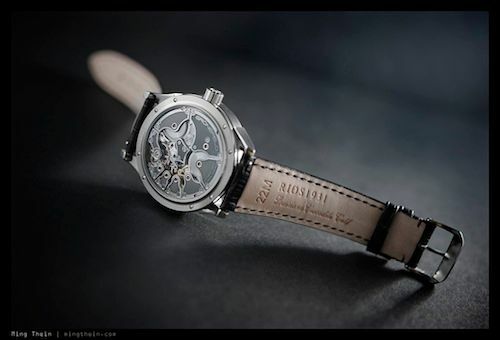 Built by brothers Bart and Tim Gronefeld, the One Hertz is actually the least complicated watch they have built – previously of Renaud et Papi, they also completed the GTM-06 tourbillon minute repeater. 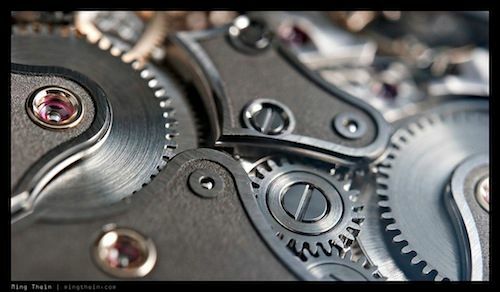 The watch ticks, in one-second increments – like a (gasp) quartz watch. Flip it over, though, and it’s clear that something much more special powers the hands – of course an entirely mechanical caliber, developed in house. 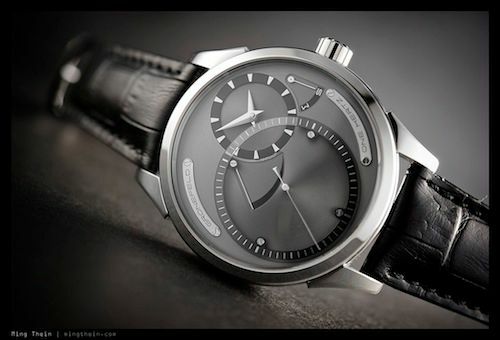 The rest of this post will be a concise – but admittedly subjective – review of this timepiece. Many thanks to Robert-Jan Broer for allowing me to contribute, and a big thank you to the collector who loaned me the watch. The One Hertz is housed in a well-finished 43x13mm case, that wears a lot larger than its dimensions suggest thanks to a minimalist bezel; massive is perhaps the right word to describe it. 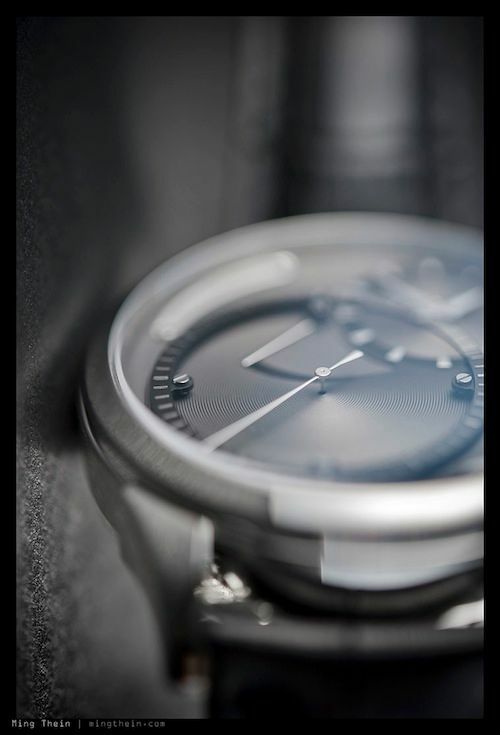 The caseband is brushed, though the bezel, lugs and part of the back are polished – lending the watch a nice variation in texture, reminiscent of the Lange cases, which is further reinforced by the proud bezel for the display back. Everything is solid and well-finished. 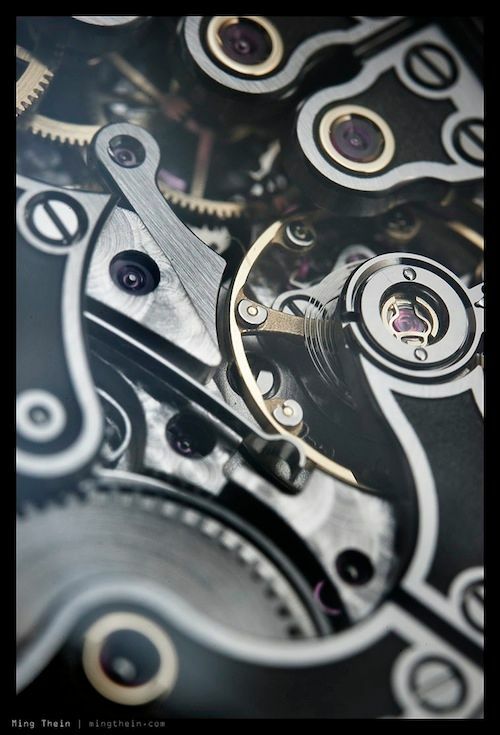 The crown is a nice surprise – you push it in to change between winding and setting functions, indicated on a small segment on the dial at 3 o’clock. Unfortunately this also limits the diameter of the crown to the caseband; a larger crown would be nice to make winding easier, as well as being slightly better proportioned to the rest of the case. Unfortunately our watch did not come supplied with a strap from the manufacture – this country has some interesting hide import regulations – so we are unable to comment here. 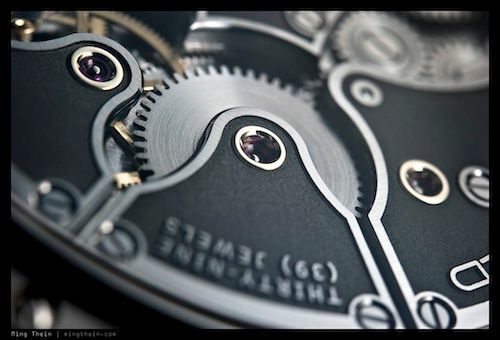 A large portion of the dial is given over to the seconds hand display; this is, after all, the feature complication of the watch. In fact, it’s so large that the scale has a transparent portion to allow the main time dial to be larger and more legible at all times. 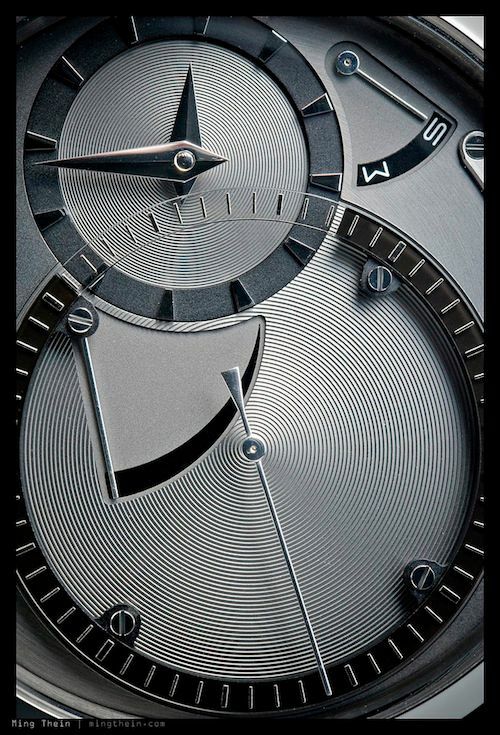 There are also small segments to show the remaining power reserve (72 hours, but without a graduated scale) and the position of the winding crown. Although the dial aesthetic resembles that of other watches – notably, various Maurice Lacroixes – the Gronefeld is both better finished, and has a much greater sense of depth thanks to many applied and recessed elements, and a good use of varied texture. In hindsight though, the quest for depth is perhaps taken a bit too far; the seconds hand is on the end of a very long pinion which gives the sense of emerging from the dial like a pin from a golf hole. Kudos for ensuring second hand alignment with the indices is perfect; further kudos for putting the time display on the right to make the watch easily readable whilst peeking out from under a cuff. 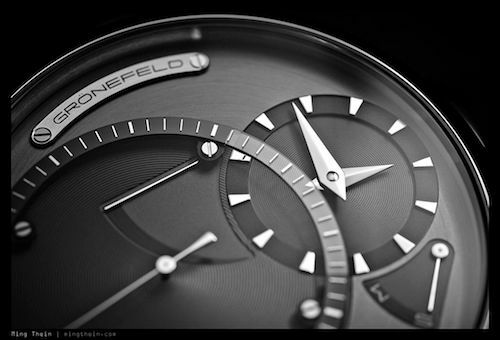 Visual balance could be improved slightly though – possibly by relocating the power reserve segment to the 7-8 o’clock position to balance out the main time dial. Now for the interesting part! 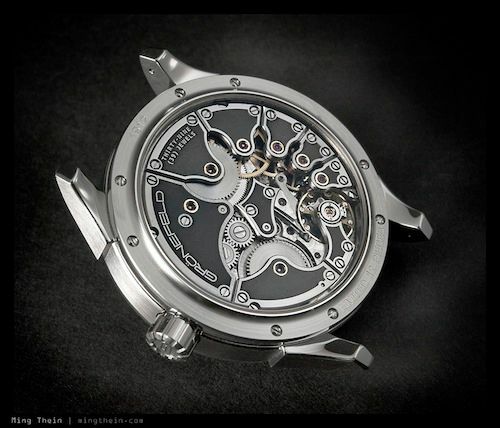 The movement – approximately 34mm in diameter – occupies a good portion of the case, and obviously doesn’t require spacers. 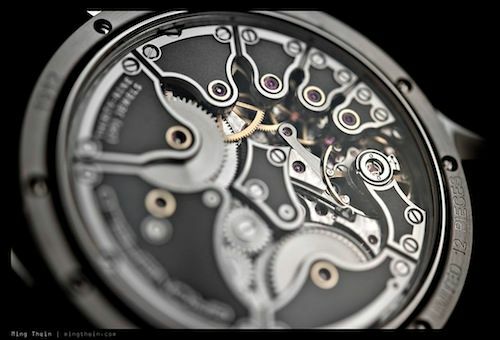 Despite its size, it’s very full; the timekeeping train snakes around the outside, culminating in a free sprung balance with adjustable poise weights and a Philips overcoil; a second barrel and short train drives the dead seconds complication. The dead seconds hand is entirely independent from the timekeeping train. It is kept synchronized and ticking by means of a secondary double sided pallet fork, whose rocking is controlled by a shallow profile gear on the fourth wheel pinion; its opposite side locks and unlocks the wolf teeth of an ‘escape wheel’ of sorts, which directly drives the second hand. Simple, elegant, and most importantly, likely to be very reliable. The movement itself is full of nice touches – each main wheel has its own bridge, including the barrels and top plate keyless works; this should make servicing a breeze. Furthermore, the primary jewel bearings are held in replaceable gold chatons; although not fastened by screws, they make a nice decorative touch and further speak to the longevity of the movement. Finishing of the plates is a mixture of classical and modern styles. Edges are beveled and polished, with perlage on some recessed plate areas and a functional brushed/ polished finish on levers etc. The main plates are etched with a dark matte finish, leaving their borders and any text proud in relief – a very nice aesthetic indeed. 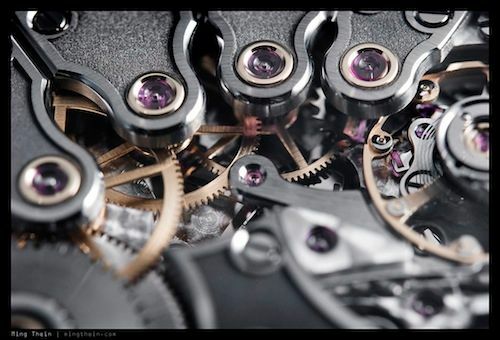 I have no idea if the hidden areas of the watch are similarly finished (I try not to disassemble watches that aren’t mine), but I would have no reason to assume otherwise. 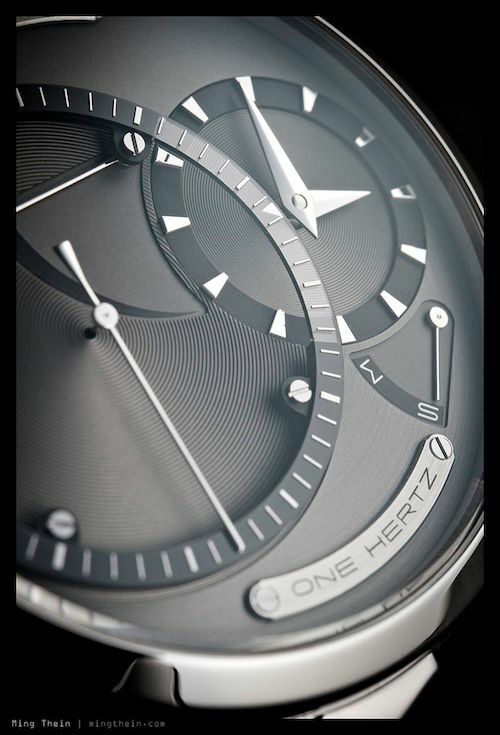 The One Hertz is an interesting proposition – even taking cost into account, which is a nontrivial 30,000 Euros or so. For that, one gets a piece that most will interpret as a nicely finished quartz watch – but is in actual fact a super-exclusive (just 12 pieces in steel, a further 20 in rose gold) handmade piece with a number of neat complications. In some ways, it felt like the anti-haute horologie watch for people who don’t want to identify with overtly mechanical pieces like the Richard Milles or Breguet Traditions. Photographic note: Images shot by the author with a Nikon D700, AFS 60/2.8 G Micro-Nikkor and several flashes.